A tribute to Zola by those who knew him best. His widow, Sandra Levitt, talks with Zola’s family, friends and co-workers in this special half-hour reminiscence of a man who planted seeds of faith in millions of lives. These two television productions, “Remembering Zola” and “In Loving Memory,” are dedicated to the viewers and readers who have loved Zola like a family member. Join us as we celebrate his work, music, joy in the Lord, and sense of humor. Remember a man who lived to open others’ eyes to the beauty of God and His Word. 00:09 BRETHREN, MY HEART'S DESIRE AND PRAYER TO GOD FOR ISRAEL IS THAT THEY MIGHT BE SAVED. 00:18 FOR THE SAME LORD OVERALL IS RICH UNTO ALL THAT CALL UPON HIM. 00:28 CONSIDERING THE TIMES AND SEASONS OF OUR WORLD TODAY. 00:33 SHALOM, HELLO AGAIN, I'M ZOLA LEVITT. 00:45 UNDERSTAND MORE IN DEPTH OUR JEWISH ROOTS? 00:49 I'M SANDRA LEVITT, I'M ZOLA'S WIFE. 00:58 "OH DEATH, WHERE IS THY VICTORY, WHERE IS OUR STING?" 01:02 THERE WAS NO STING. 01:03 ZOLA IS IN HEAVEN WITH THE LORD AND I KNOW HE IS BEING BLESSED. 01:07 I KNOW THEY WELCOMED HIM AND SAID, WELCOME, GOOD AND FAITHFUL SERVANT, WELL DONE. 01:14 I WANT TO READ YOU SOMETHING FROM EXODUS, AND IT IS EXODUS 32:26. 01:30 LEVITTS ARE PART OF THE LEVITES AND WE HAVE GATHERED TOGETHER. 01:33 MARK LEVITT AND AARON LEVITT, YOU HAVE BEEN A BLESSING TO THE MINISTRY. 01:37 I WANT YOU TO KNOW HOW MUCH I'VE BEEN BLESSED BY KNOWING BOTH OF YOU. 01:41 WHAT WAS IT LIKE, WHAT HAVE YOU LEARNED FROM WORKING WITH THE MINISTRY? 01:53 COMPARED WITH WHAT IT'S LIKE JUST TO GO TO A REGULAR J-O-B. 02:07 AND HOW MUCH OF A NON-CHARISMATIC TEACHER THAT I'VE BEEN. 02:12 THEY'RE BLESSINGS, PAUL TALKS ABOUT THE HAND. 02:16 IT'S EACH INDIVIDUAL FINGER BELONGS TOGETHER, THE HAND BELONGS TOGETHER. 02:20 SO, THAT'S WHAT WE DO. 02:26 AND HE USED THEM TO GOD'S GLORY. 02:48 THEN TODD BAKER HEADING UP THE "TO THE JEW FIRST" EFFORTS. 02:56 THAT HAVE GROWN WITH OUR MINISTRY AND HELPED WITH OUR STEWARDSHIP. 02:59 GOD HAS BLESSED THEM ALL AND WE HAVE BEEN BLESSED BY THEM. 03:08 "WHAT IS IT LIKE BEING ZOLA LEVITT'S SON AND WHAT DO YOU SAY TO THEM? 03:12 WELL, IT'S HARD TO KNOW WHAT TO SAY. 03:14 IT'S JUST NORMAL TO ME, MY DAD'S ALWAYS BEEN ZOLA LEVITT, BUT HE'S JUST A REGULAR DAD TO ME. 03:25 DID PRETTY MUCH EVERYTHING AND HE WAS A GREAT DAD. 03:29 I KNOW PEOPLE ALWAYS USED TO SAY TO US, "YOU LOOK LIKE REGULAR PEOPLE". 03:39 I THINK PEOPLE EXPECT DIFFERENT THINGS FROM YOU. 03:49 I THINK IS JUST A BLESSING IN ITSELF, ALSO. 03:52 GLAD TO DO IT. 03:53 AND YOU'RE GOOD AT IT AND WE LIKE THAT. THANK YOU. 03:57 ZOLA LOVED WRITING MUSIC. 04:00 IT WAS ONE OF HIS GIFTS THAT GOD GAVE HIM. 04:07 "I SHALL NOT WANT"
04:21 ♪I SHALL NOT WANT, ♪I SHALL NOT WANT. 04:44 "I SHALL NOT WANT"FROM HIS RECORDING OF MESSIAH. 04:47 I WANT TO READ SOME SCRIPTURE TO YOU BEFORE WE INTRODUCE YOU TO SOME GREAT GUYS. 05:08 COUNSELED HIM IN SUCH WONDERFUL WAYS. 05:10 DR. TOM MCCALL, KEN, WHO IS OUR PRODUCER AND DR. JEFFREY SEIF, JUST WONDERFUL GODLY MEN. 05:17 TOM, I'M GOING TO START WITH YOU. 05:20 HOW DID YOU MEET ZOLA? 05:22 HOW DID THIS ALL COME ABOUT? 05:29 AND WE'RE THE ONES THAT ARE SAD BECAUSE WE MISS HIM. 05:42 SHORTLY AFTER HE HAD COME TO KNOW THE LORD WITHIN 6 MONTHS, I THINK. 06:13 IN FACT ALL OF THEM WERE TO DO WAS TO FIND PLACES FOR THE KIDS TO SLEEP. 06:36 ABOUT FINDING A PLACE FOR THESE KIDS TO SLEEP, ABOUT 20 OF THEM. 06:40 DID WE HAVE A PLACE? 06:41 OH, WE HAD SOME ROOM AND HE WAS GLAD TO HEAR THAT. 06:46 THEN HE TOLD ME ABOUT HIS OWN EXPERIENCE AND HOW HE CAME TO KNOW THE LORD. 06:56 AND HE SAID, "NO, I HADN'T". 06:58 DIDN'T KNOW THERE WERE ANY OTHERS. 07:01 SO, I TOLD HIM TO COME OUR MEETINGS AND YOU'LL BE ABLE TO MEET THEM. 07:08 BOY, HE WAS EXCITED ABOUT THAT. 07:13 YOU KNOW, "I THOUGHT I HAD BECOME A GENTILE WHEN I ACCEPTED JESUS". 07:18 WELL, IF I HAVE TO DO THAT IN ORDER TO HAVE ETERNAL LIFE, OK.
07:26 "I THOUGHT I HAD BEEN CONDEMNED TO EAT HAM ON WHITE BREAD WITH MAYONNAISE". 07:34 "I THINK WHEN I WAS SAVED THERE WERE 6 OF US IN THE WHOLE NATION". 07:38 I REMEMBER HIM SAYING THAT AND LAUGHING. 07:42 6 JEWISH BELIEVERS IN THE WHOLE NATION. 07:43 NOW, HE'S BECOME TO BE KNOWN AS THE BEST KNOWN. 07:51 HE HAS COME TO BE KNOWN AS THE BEST KNOWN AND MOST LOVED JEWISH BELIEVER IN THE WORLD. 08:02 A GREAT PRIVILEGE AND A GREAT RESPONSIBILITY AND HE BORE IT VERY WELL. 08:06 I AGREE, WITH GREAT HUMOR, I MUST ADD. 08:12 AND YOU KNOW GOD'S JUST ROLLING HIS EYES AT HIM, BUT THAT'S OK, TOO. 08:19 AND THE PROGRAMS HAVE JUST GOTTEN BETTER AND BETTER AND BETTER. 08:23 HOW DID THIS HAPPEN FOR Y'ALL? 08:25 SANDRA, I THINK IT STARTED BACK IN 1978, WAY BACK THEN. 08:31 IT'S HARD TO BELIEVE, TIME HAS JUST FLOWN BY SO QUICKLY. 08:34 WE'VE DONE, I GUESS, 1000 PROGRAMS, ALMOST, SINCE THE FIRST DAY. 08:38 BUT, GOING BACK TO WHERE WE FIRST MET. 08:43 "HEART OF THE MATTER" WHICH ZOLA HOSTED. 08:51 WHETHER IT BE SCRIPTURE, CURRENT EVENTS, WHATEVER. 08:57 WOULD YOU MIND WORKING WITH ME ON IT? 08:59 AND IT SURPRISED ME BY SAYING "YES". 09:01 SO WE DID THIS LITTLE PROJECT, IT WAS ON THE ANTI-CHRIST CALLED "WONDERMAN". 09:07 IT WAS A SMALL LITTLE FILM. 09:15 APPROACHED HIM AND ASKED, "ZOLA, WOULD YOU LIKE TO DO A CHRISTMAS SPECIAL, A ONE HOUR SPECIAL?" 09:23 "KEN, HOW WOULD LIKE TO PRODUCE THIS SHOW FOR ME?" 09:33 CBN BECAME INVOLVED AND THE PROGRAM JUST GREW AND GREW. 09:39 WHAT'S HAPPENED OVER THESE MANY YEARS. 09:44 I LOVE THE WAY IT LOOKS, THEY LOVE EVERYONE THAT'S ON IT. 09:48 SO, IT'S REALLY BEEN A REAL TESTIMONY TO GOD'S GRACE AND TO GOD'S MERCY. 09:53 I'VE BEEN BLESSED TO BE PART OF IT. 09:54 IT'S JUST BEEN WONDERFUL. 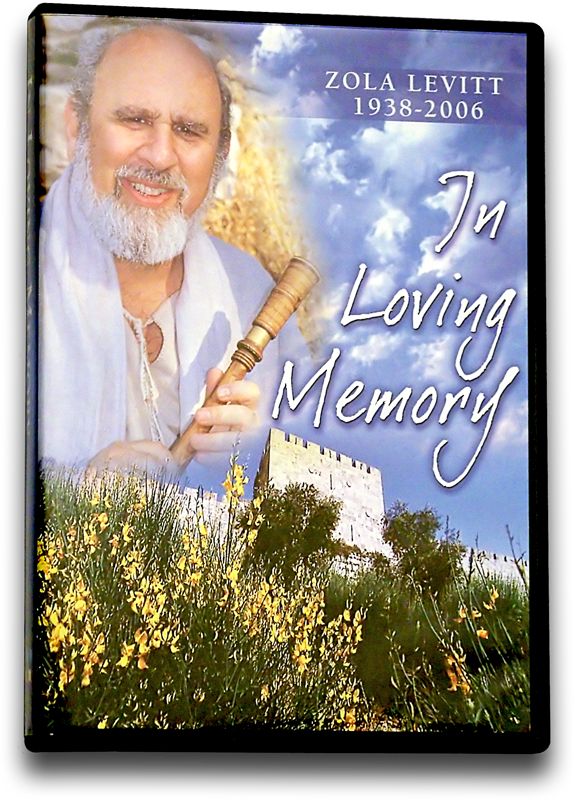 10:07 I LEARNED MORE ABOUT BEING JEWISH OR CHRISTIAN FROM THIS SERIES OF TAPES. 10:12 HOW DID THAT HAPPEN? 10:14 ZOLA REALLY GAVE ME MY FIRST BREAK IN MINISTRY. 10:21 WITH THE AMERICAN BOARD OF MISSIONS FOR JEWS AND ZOLA WAS INVOLVED IN THE ORGANIZATION. 11:04 SO, I COUNT HIM AS JUST A GREAT START AND A BLESSING. 11:10 AND GIVE ME AN OPPORTUNITY TO WORK WITH HIM. 11:12 HE DID THAT A WHOLE LOT. 11:13 HE FOUND THE BEST IN EVERYONE. 11:15 HE KNEW WHAT THEIR GIFTS WERE. 11:17 HE KNEW HOW TO USE THEM IN EVERYONE. 11:25 YOU KNOW, I LIKE WHAT YOU'RE SAYING, LET'S DO SOMETHING WITH THAT. 11:30 OR HOW MANY PEOPLE HE'S HELPED PUT INTO A MINISTRY IS WHAT A TESTIMONY. 11:37 WHAT A REAL TESTIMONY. 11:54 AND I JUST PRAY GOD'S BLESSINGS ON THE MINISTRY. 11:58 THE WORK STILL NEEDS TO BE DONE. 12:01 THE STORY NEEDS TO BE TOLD. 12:08 STARTING WITH SO LITTLE OVER SUCH A SHORT PERIOD OF TIME AND THE JOURNEY CONTINUES. 12:17 YOU'RE GOING TO MEET LOTS OF INTERESTING PEOPLE ON FUTURE SHOWS. 12:21 ♪WE ARE THE CHOSEN, ♪THE PEOPLE OF GOD. 12:25 ♪CHOSEN BY HIM TO BE ♪GIVEN HIS LAW. 12:32 ♪AND IN THIS WORLD WE HAVE TO ♪COUNT ON HIM TO GET LOVE. 12:38 ♪WHO LIKES THE CHOSEN, ♪THE PEOPLE OF GOD? 12:41 ♪WHO DOESN'T THINK WE'RE ♪INCURABLY ODD? 12:44 ♪WHO SAYS THAT SOME OF HIS ♪BEST FRIENDS ARE JEWS? 12:48 ♪OH LORD, WE WISH THOSE PEOPLE ♪WERE THE ONES YOU DID CHOOSE. 12:55 THAT WAS "WE ARE THE CHOSEN" FROM "BELOVED THIEF". 12:58 THAT WAS RECORDED, ONE OF ZOLA'S VERY FAVORITE RECORDINGS. 13:00 I'M GLAD YOU GOT TO HEAR IT. 13:25 AND I THOUGHT YOU WOULD LIKE TO MEET THEM AND GET TO KNOW THEM A LITTLE BETTER. 13:34 YOU HAVE ALREADY TALKED AND MET HIM. 13:35 TODD BAKER IS WHAT WE LOVINGLY CALL OUR "JUNIOR THEOLOGIAN"
13:39 NOT BECAUSE HE'S TINY, BUT BECAUSE HE IS NOT SENIOR. 13:45 DOES THAT MAKE SENSE? YES. 13:47 LOU HAYS, ONE OF HIS OLDEST FRIENDS AND OF COURSE THE EDITOR OF THE LEVITT LETTER. 13:51 TONY, TELL ME ABOUT ZOLA. 13:53 WELL, I BEGAN WITH THE MINISTRY IN 1989. 14:12 AND I GUESS I SATISFIED HIM WITH WHATEVER ANSWER I GAVE I HIM AT THE TIME AND THAT WAS IT. 14:18 THAT WAS THE INTERVIEW. 14:20 BUT, YOU ALSO HAVE A THEOLOGICAL DEGREE. 14:25 SO, YOU ARE A PASTOR ALSO. 14:29 BUT, YOU HAVE THOSE CREDENTIALS. 14:30 I HAVE A PASTOR'S HEART. 14:32 I THINK THAT'S WHAT HE WAS LOOKING FOR, WAS THE PASTOR'S HEART. 14:40 THE FIRST TOUR OF DECEMBER 2000 WAS 18 PEOPLE. 14:48 AS THE SAYING GOES, TO GET MY FEET WET WITHOUT BEING OVERWHELMED AND DROWNED. 14:52 I BELIEVE IT WAS WET THAT DECEMBER. 15:18 AND I THINK THAT REALLY BEGAN HIS SPEAKING IN THE FLORIDA AREA AND TO THE CHURCHES THERE. 15:24 BUT, HIS LOVE FOR ISRAEL ALWAYS CAME OUT. 15:26 IT DIDN'T MATTER IF HE WAS IN JERUSALEM OR ORLANDO OR IN DALLAS OR WHEREVER HE MIGHT BE. 15:31 WE TALK ABOUT THE LOVE OF ISRAEL, YOU KNOW, HE HAD TALKED ABOUT WITNESSING TO THE JEWS. 15:43 WITH MORE THAN JUST BEING ANSWERING QUESTIONS FROM THE MINISTRY. 15:49 OR HOW DID THIS ALL COME ABOUT, "TO THE JEW FIRST"? 16:06 WELL, OK, WE'LL GO OVER THERE AND COME BACK AND TELL US WHAT HAPPENED. 16:11 WELL, WE WENT OVER THERE AND OF COURSE, IT WAS PHENOMENAL. 16:26 WELL WE NEED TO START A FUND CALLED "TO THE JEW FIRST"
16:38 AND SINCE THAT TIME HE HAS SUPPORTED US AND WE GO EVERY YEAR. 16:48 WE HAVE AT LEAST 2 "AMBASSADORS" THAT GO WITH US NOW. 16:51 IT STARTED FROM JUST YOU AND ONE OTHER GUY. 16:58 AND I THINK WE HAD 2 FEMALES AND 2 MALES THIS SPRING SO WE ARE REALLY, GOD HAS BLESSED IT. 17:05 THAT'S ALL YOU CAN SAY ABOUT IT, GOD HAS BLESSED IT. 17:12 BECAUSE IT'S THE HEART OF GOD THAT HE'S EXPRESSING. 17:14 AMEN, AND WE'VE ALL BEEN BLESSED BY IT. 17:19 BECAUSE YOU ARE ONE OF HIS OLDEST AND DEAREST FRIENDS AND I LOVE HOW YOU ALL MET. 17:23 YOU HAVE TO TELL US HOW YOU MET. 17:49 HE TUGGED ON MY SHOULDER AND HE SAID, I WANT TO SEE YOUR GAME. 17:53 I SAID, WHAT DO YOU MEAN? 17:56 SO I CAN GO STUDY IT AND SEE HOW YOU GOT THE DRAW. 17:58 HE LOVED CHESS. HE LOVED CHESS. 18:03 AND REMAINED FRIENDS THROUGH THE CHESS CLUB FOR MANY, MANY YEARS. 18:13 AND LISTENED TO HIM SNORE. 18:16 WE GOT SEPARATE ROOMS. 18:17 WE HAD TO SIT IN CHESS TOURNAMENTS TOGETHER. 18:24 I DIDN'T GET ANY SLEEP THAT FIRST NIGHT. 18:30 OR YOU WOULD TALK TO EACH OTHER ALMOST EVERY SINGLE NIGHT. 18:38 BECAUSE IT'S 26 YEARS AGO I FIRST MET HIM AND I LIVED IN DALLAS AT THE TIME. 18:43 I MOVED TO OKLAHOMA 8 YEARS AGO, YET I STILL HEARD FROM HIM 5 NIGHTS A WEEK. 18:51 YOU WOULD SEND YOU ALL THESE ARTICLES FOR THE LEVITT LETTER. 18:57 AND I'M VERY INTERESTED IN MID-EAST POLITICS, REALLY ALL KINDS OF POLITICS. 19:26 DUNCAN'S GOING TO LEAVE? 19:28 SO, I SAID, SURE I WOULD AND I'VE BEEN DOING IT FOR OVER 2 YEARS NOW. 19:31 I LOVE DOING IT. 19:38 EVERYBODY LOVES THE CARTOONS AND THEY LOVE ALL THE ARTICLES. 19:41 YOU'VE DONE A WONDERFUL WITH IT. 19:48 AND HE HAS USED THEM TO GOD'S GLORY AND THAT IS A WONDERFUL TESTIMONY. 19:53 EVERY VALENTINE'S DAY, ZOLA WROTE ME A VALENTINE'S SONG. 19:57 THIS IS THE LAST ONE HE WROTE ME. 20:04 AND I'D LOVE TO SHARE IT WITH YOU. 20:28 WELL, HERE WE ARE IN JERUSALEM AS FOR MANY OF OUR NEW SERIES. 20:33 LET ME PUT ON, I WOULD WEAR A PRAYER SHAWL AT CERTAIN SERVICES EVENING SERVICES, AND SO ON. 20:38 I WOULD NORMALLY WEAR A PURE WHITE ONE BEING LEVITE. 20:45 THEY COME IN VARIOUS KIND. 20:47 THIS ONE WAS HANDY. 20:51 AND A BOY CARRYING THE TORAH WHO HAS JUST TURNED 13. 20:58 AND HE PREPARED FOR THIS ONE OF A KIND MOMENT WHEN HE'D BECOME A MAN. 21:03 THIS PIECE OF BREAD, THIS THIRD CUP OF WINE AT THE PASSOVER TABLE, THAT IS COMMUNION. 21:10 NOW YOU UNDERSTAND BETTER. 21:13 WHEN YOU TAKE IT NEXT TIME, REMEMBER WHAT THE SIGNIFICANCE IS. 21:36 THAT ONE OBEDIENT TOTAL IMMERSION THAT CONSECRATES ONE FOR SERVICE. 21:46 IS IT ISRAELI OR IS WORLDWIDE, DID IT SUCCEED IN THE EMPIRE? 21:57 A JEWISH MESSIAH, OUT OF A JEWISH OLD TESTAMENT AND SO ON. 22:11 UNLIKE THE BODY OF THE ONE WHO RESURRECTED, THE MESSIAH. 22:15 IF JESUS IS NOT MESSIAH, I WOULD SAY THE WHOLE BIBLE IS UNTRUE. 22:22 BUT, THE PROPHECIES ARE ABSOLUTE AND OBJECTIVE PROOF. 22:49 BECAUSE HE DIDN'T TO GO OUT AND BUY ME A GIFT. 22:52 I REALLY KNEW BETTER. 23:02 AND IT HAD GROWN AND HOW WE'D COME TOGETHER. 23:04 THEY REALLY WERE WONDERFUL SONGS AND I'M GLAD YOU GOT TO HEAR THAT ONE. 23:08 JOINING ME NOW IS A KIND OF SPECIAL GUEST FOR ME. 23:10 WE ALL HIM OUR "MAN IN JERUSALEM", BUT HE'S ALSO MY SON, WILL KING. 23:20 AND HATING SAND IN THE GOLF COURSE AND WHAT DID YOU SAY TO ME? 23:23 I LOVED THIS, PLEASE TELL THEM WHAT THEY SAID. 23:25 I GUESS BEING A FORMER ARMY MAN, I HAD A DIFFERENT LOOK ON IT. 23:41 TO RALLY THE TROOPS TO COME BACK. 23:49 WHO LIKES TO ARRANGE THINGS AND MAKE THINGS RIGHT, GENERAL ZOLA IS WHAT WE'RE CALLING HIM NOW. 24:15 AND THEN YOU CAME BACK AND YOU SAID, I FEEL LIKE I NEED TO BE THERE AND THEN WHAT HAPPENED? 24:20 HOW DID THAT ALL HAPPEN FOR YOU? 24:21 WELL, IT WAS A GRADUAL PROCESS. 24:27 THAT WAS MY VERY FIRST TIME THERE, IMMEDIATELY AFTER THE INTIFADA. 24:31 HARDLY ANYONE ELSE WAS THERE. 24:48 AND YOU KNOW THE FIRST TIME YOU GO, IT'S JUST TOTALLY AMAZING. 24:57 WE HAVE SOMETHING 2000 YEARS OLD, IT'S A LOT TO TAKE IN THE FIRST TIME. 25:07 AND EACH TIME I WENT, IT'S, YOU KNOW, I REALLY LIKE IT HERE. 25:16 I'VE HAD ENOUGH WITH THE 10 HOUR PLANE RIDE, I JUST WANT TO LIVE HERE. 25:19 AND IT HAS BEEN A BLESSING. 25:21 I WANT TO THANK YOU FOR BEING "OUR MAN IN JERUSALEM"
25:24 AND I WANT TO THANK YOU FOR BLESSING THE MINISTRY WITH THE TRUTH THAT IS ISRAEL. 25:42 WE HAVE MADE MANY PROGRAMS AND WE WILL GO ON. 25:45 WE'VE GOT PROGRAMS WE STILL WANT YOU TO SEE. 25:52 IS A SIX-PART SERIES ON A RETROSPECTIVE OF THE MINISTRY, 27 YEARS OF THE MINISTRY. 26:03 WHICH I THINK YOU'LL LIKE THAT, TOO. 26:05 AND AS ALWAYS, SHA'ALU SHALOM YERUSHALAYIM, PRAY FOR THE PEACE OF JERUSALEM. 26:38 HERE IS THE OLD JEWISH TRUNK AND HERE IS THE YOUNG STRONG CHURCH GRAFTED IN. 26:43 THE GENTILES ARE GRAFTED INTO THE JEWISH OLIVE TREE. 26:46 THEY GET THEIR NOURISHMENT FROM THE JEWISH ROOTS. 26:52 AND STAND IT UP ON THE GROUND SOMEWHERE WITH NO ROOTS. 26:54 IT'LL DIE IN A WEEK. 26:56 WE HAVE WHAT WE CALL IN THE UNITED STATES "REPLACEMENT THEOLOGY"
26:59 WHERE YOU REPLACE THE IDEALS OF A PEOPLE. 27:02 THE LIBERAL CHURCH BELIEVES THEY HAVE BELIEVE THEY HAVE REPLACED ISRAEL AS THE NEW CHOSEN PEOPLE. 27:09 SOME CHURCHES TEACH THIS "GOBBLEDY GOOK". 27:13 TRULY, I FEEL SORRY FOR PEOPLE WHO DON'T SEE WHAT'S GOING ON IN ISRAEL. 27:25 THEN THERE WERE UNDER KING DAVID AND SOLOMON AND STILL COMING. 27:28 THE JEWS HAVE BEEN 4000 YEARS. 27:30 PALESTINIANS HAVE BEEN THERE SINCE THE 1960'S. 27:34 THAT'S HOW LONG THE ARABS HAVE CALLED THEMSELVES PALESTINIANS. 27:37 THAT'S A PR GAME AND IT HAS WORKED ON AMERICANS, MAINLY BECAUSE OF OUR MEDIA. 28:00 BECAUSE YOU WILL BE ONE OF THE RIGHTEOUS. 28:02 WELL, UNTIL WE TALK AGAIN, SHA'ALU SHALOM YERUSHALAYIM, PRAY FOR THE PEACE OF JERUSALEM.